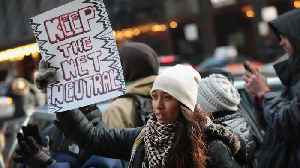 One News Page > News Videos > Federal Communications Commission > What's Next For Net Neutrality As Dems Renew Legal Battle? A new Democratic net neutrality proposal made the road to reinstate the rules more crowded. Now a legislative push and a legal challenge share a goal. Democrats, alongside House Speaker Nancy Pelosi , recently announced the Save the Internet Act . The legislation could reinstate net neutrality protections that the FCC revoked in 2018 — but it will likely face an uphill battle. The first challenge is Congress itself. Democrats expect a House vote to go smoothly with their majority, but the Senate has tilted slightly more Republican since the last time it passed net neutrality rules in 2018 . The margin could be even narrower now — but leadership still sounds hopeful that both houses will finally agree on something. "Last spring, our colleagues in the United States Senate were given that choice — to side with the average person rather than the big special interests," Said Senate Minority Leader Chuck Schumer. "Now we have a Democratic house, and Republicans will have a second chance." SEE MORE: Democrats Introduce Bill That Would Reinstate Net Neutrality Laws Before this bill, one of the strongest cases for consumer protection came when several state attorneys general and consumer advocates sued the FCC over its decision to repeal the net neutrality rules. If the Save the Internet Act passes, it's not exactly clear what will happen to that lawsuit. If internet protections are restored, attorneys might not need to argue a core point of their case. And if the bill becomes law, it would help prevent more of the the back-and-forth regulation that has made net neutrality so complicated. It would prohibit the FCC from reissuing rules of similar substance unless Congress passed new laws to permit them first. With New Democratic Backing, What&apos;s Next In Fight For Net Neutrality?